Apple's iOS 5, which is tied to the upcoming iCloud service, debuted at Apple's Worldwide Developers Conference in June. MacRumors says the latest update includes fixes but no major new features. But CNET's Edward Moyer says the release includes a Hearing Aid Mode designed to improve compatibility between iOS devices and hearing aids. And 9to5Mac discovered that the new software includes the speech recognition feature believed to be called Apple "Assistant," which will combine on-device and cloud processing to recognize natural-speech instructions and be able to use various data sources to present the best set of results. There are some hiccups, however. "The functionality is also not yet active, perhaps because Apple is yet to secure the final deal believed to be in negotiation with Nuance, and as such the server-side processing is unlikely to be ready. Sources have suggested that Assistant support is only initially intended for the smaller iOS devices, iPhone and iPod touch, though iPad support is a possibility," writes SlashGear's Chris Davies. 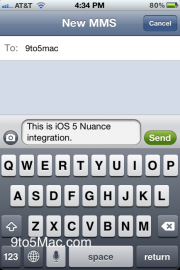 There are plenty of places to turn to learn about the pros and cons of iOS 5. PCWorld posted a popular story titled "Five Ways Apple Rips Off Android with iOS 5" and PCWorld's Tony Bradley just finished a "30 Days With the iPad" series in which he looked at what iOS 5 and iCloud bring to the table and the impact they might have on the capabilities of the iPad as a PC replacement. Developers can download iOS 5 beta 5 from Apple. To see the full change log for iOS 5 Beta 5, visit BGR.